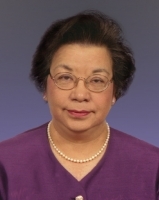 Mrs Tsang is a 1958 graduate of Commerce of the Hong Kong Technical College. She has strong bond with PolyU and is enthusiastic in charity work. She is Founding President of the PolyU (Eastern Canada) Association and Life Member of the PolyU Foundation. She is also Founding Director of The Chinese Cultural Centre of Greater Toronto, Member of the Board of Governors of Yee Hong Centre for Geriatric Care, and Founder of Elixir Medical Laboratories Limited and PJ Travel Inc.